We have long touted Mobile First as a good sustainable web design strategy. Mobile-friendly websites and applications are better for users, better for energy efficiency, and now better for Google search results. If the fact that over 60% of all web traffic comes from mobile devices isn’t compelling enough to inspire a mobile retrofit for your own site, perhaps Google’s recent announcement will be. As of this week, Google changed its algorithm to offer better search results for mobile-optimized websites. In other words, if your site is designed to work on smartphones and tablets, it will show up higher in search results than those that don’t. 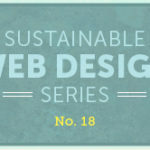 This is a huge step forward for web sustainability. Much of the wasted electricity that comes from front-end internet use is generated by mobile users trying to navigate sites that aren’t optimized for their devices. The time and energy you save by navigating a mobile-optimized site on your smartphone may not seem like much, but consider this: there are currently over 3 billion active internet users generating nearly one billion tons of annual carbon emissions. Anything that saves users time (while also reducing frustration) will cut down on electricity use and greenhouse gas emissions. Speaking of frustration, it’s obviously a huge boon for users, too. Sites and apps that load quickly and present content or features in context with a user’s specific device will have a higher rate of retention and more success than those that don’t. If your site gets in the way of users purchasing, searching, navigating or contacting you, they will be quick to move on to the next site that doesn’t. And now that site will likely be served in Google results before your own rather than after. Does your site use Flash? Do you need to zoom in to read blog posts or page copy on a smartphone? Do you have trouble navigating from page to page on a smartphone? Is it difficult to click on links or buttons when using a smartphone or tablet? Are a lot of clicks required to accomplish tasks—such as purchasing an item or booking a ticket—when using your website on a tablet or smartphone? If you answered yes to any of the above five questions, it is likely your site now shows up lower in search results than it did before the algorithm change. Perhaps it is time to consider migrating to a responsive design.